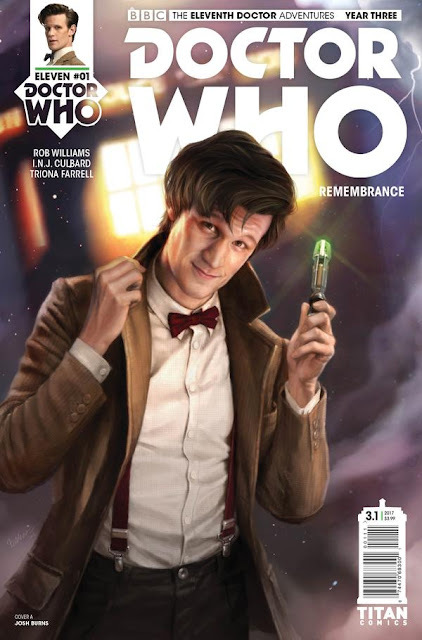 Doctor Who: THE ELEVENTH DOCTOR #3.1 Review @comicstitan | Warped Factor - Words in the Key of Geek. Britzit means Britzit, says Tony. Oooh, we love a bit of thinly, not to say barely veiled satire in our Doctor Who. And they don’t come more barely veiled than the start of this new year with the Eleventh Doctor – a bunch of angry Nigel Farage clones screeching ‘Britzit!’ cause the Doctor and Alice grief on the colony Britzit 247 – a colony, as the Doctor says, built on mutual annoyance. So why go there in the first place? The time travelling twosome have gone in search of the last pristine copy of the last album by their former companion and pop-rock chameleon Jones (Bowie in all but name, and so another good gracenote for 2016, the year that killed almost everybody, or at least their hopes and dreams). The Doctor and Jones have kept in a bizarre and complex sort of touch since Jones went off to take the world by storm with his multi-faceted musical career. Jones leaves super-duper secret invisible cryptic clues for the Doctor in the sleevenotes of his albums, the Doctor figures them out and meets him at some hinted-at location. And so, the Doctor comes looking for the last pristine copy of Jones’ last album for a meet-up – and it just so happens to be on Farageworld, or Britzit 247, which even comes equipped with its own CyberBoris. There’s even the delicious idea that, after a narrow escape from Bitzit 247, a single Farage-clone stows away on board the Tardis and is summarily kicked out on the first planet they come to, to repeat his mindless ‘Britzit’ chant endlessly and annoy the ever-loving pants off the locals. This is Happiness Patrol-thin satire, only done with rather more joy and zany charm. Just to add to the fun, they go looking for the album in the shiny yellow wonderfest that is Bessie 2. What they find once the Doctor’s deciphered the sleevenotes on ‘the tall pale earl’s final album, ‘Whitestar’ though is somewhat sobering. The last message encoded into the sleevenotes directs them to Jones’ funeral, and we get to pause there for a moment, while some great words are spoken by one British legend about, effectively, another. But then, as ever in Who, we’re on to the next thing – the Doctor gets sent a courier message by ‘Lifeform Unknown’ (as the Tenth Doctor would have said, that is textbook enigmatic), to go to an entirely different planet. Sad though they are in the wake of Jones’ passing out of the universe of the living collective consciousness, Alice argues that life is finite, so they should have some fun while they can, because fun, above all, is what Jones would wish for them. Following the instructions in the message leads them to a planet that was a desert last year in relative time, and is now a jungle. Its indigenous dominant lifeform? Kaput. Gone. Out of the game. And then they start coming across lifeforms that aren’t from round here, but very particularly are no more. Lifeforms that have run down the curtain and joined the choir invisible. Not to put too fine a point on it, ex-lifeforms. Annnd as the issue ends, the Doctor and Alice press a great big threatening button they really shouldn’t have pressed and find themselves if not precisely ‘ex’ then at least significantly more….’agey’ than they previously were, for reasons that probably have something to do with the creature they discover, which is very much not ex. It’s the arrival in comic-books of a villainous species which had something of a resurgence in 2016, against almost all the conceivable odds. What they’re doing here, it’s absolutely, far too early even to begin to speculate, because this is the Eleventh Doctor, and he has arcs that would make the Gordian Knot think about its actions and retire to plant begonias, so the chances of knowing what even might be going on after just a single issue are so insanely remote it’s beneath both us and you even to try. Still, their arrival here makes for an interesting hook into the next issue, and may well lead to additional complication, even assuming Alice and the Doctor manage to stop ageing to death, as the previous visitors to this world have done. What issue #3.1 does, and does well, is give us pause to reflect over what was a staggeringly unpleasant year, that saw both the rise of the idiocracy, and the loss of so many enlightening figures that made the world a better place. Rob Williams, in an issue that carries the title ‘Remembrance,’ helps us come to terms with both parts of the different world we now inhabit, by helping us laugh at the angry idiots, and mourn, and even come to terms with the loss of, amazing people. But it’s in the shift in perspective, the putting both idiocy and loss behind us and looking to the next great adventure because time is short and the universe, the world, the potential of life is huge, that the real lesson of Remembrance comes. ‘Life is finite,’ says Alice, ‘so let’s have fun while we can.’ At the dawning of a new year, that’s a powerful message for a science-fantasy comic-book, but it’s one that resonates strongly with readers as we go into what could well prove to be an even more uncertain year. Artwise, INJ Culbard, along with colourist Triona Farrell, gives us a different take from the dark, swirling intensity of the last few issues of Year 2. That suits the mood of new beginnings, and here, they shy away from neither the anger nor the idiocy of the Farage-clones, and give Jones’ funeral, in a sequence of his different ‘personas,’ the moment of pause and respect it deserves, standing as an avatar for all those in the creative world whose loss in 2016 was felt by millions whom they touched. 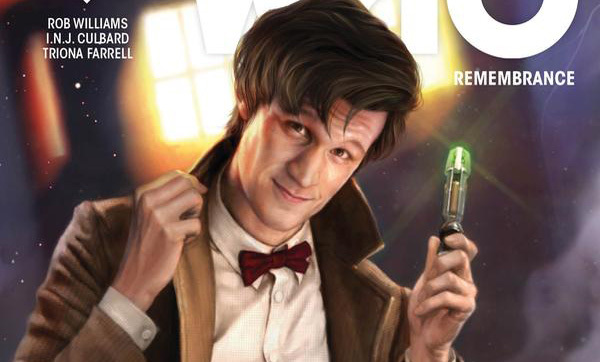 The Eleventh Doctor has begun his third year in the happy home that is Titan Comics. While, if we’re splitting hairs, only the last few pages here are probably set to be absolutely necessary to an understanding of his adventures going forward, this issue could hardly be more timely, and acts, if anything can, as a bout of post-2016 two-dimensional therapy. Pick it up, read it through, blow your nose, have a good cry, and get ready – the cunning timey-wimey devils at Titan have got another year of Eleventh Doctoring in store.